Now that we’ve become Vegan we’ve been faced with the challenge of replacing the meat, cheese and mayo in these sandwiches. I’ve managed to make us amazing roasted vegetable ones with hummus and avocado to replace the latter two of those ingredients but the man wanted something “with some substance” as he would say. So I started to do some research and he tells me, “No tofu or mushrooms either!”. This made for an even BIGGER challenge. But I accepted it and decided to go with one of his favorites. 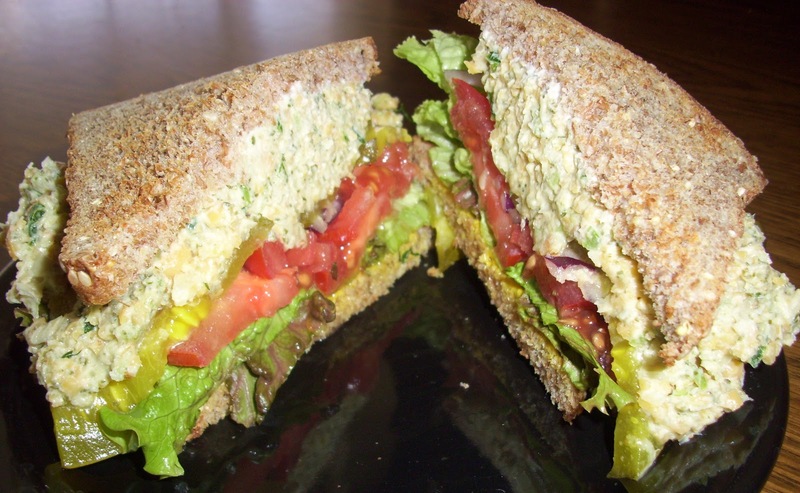 The tuna salad sandwich. I was inspired by this amazing website called Chez Bettay The Vegan Gourmet and decided to put my own twist on her mock tuna salad. It was AWESOME! Rance could not believe it when it showed up in his lunch box! The size and taste leave nothing else to be desired. Per-fishy-ection! I’m definitely going to experiment with some other sandwich fillings and keep you posted. Until then, give this a try. I promise you, your mind will be blown away! Look at it! It’s big, beautiful and super fast to make. Plus, with this recipe you can get at least 6 servings out of it. Now go on, do it. OPTIONAL: Ezekiel sprouted grain bread, mustard, lettuce, tomato, pickles, pepperonchinis, tomato and any other sandwich toppings you love! Place garbanzo beans in a food processor fitted with knife blade and pulse 5-6 times to get a medium crumble. You don’t want a hummus paste, some chunks are good. If you don’t have a food processor, mash the beans with a potato masher in a large bowl to desired consistency. Scrape the beans into a large bowl. Finely chop the bell pepper, celery, green onion, red onion and pickle using the same food processor bowl and then add them to the beans. Sprinkle in remaining ingredients and mix until well combined and creamy. To assemble, scoop 1/2 cup of the salad on to two slices of toasted sprouted grain bread and load up with your favorite toppings. You could even use this mixture in a sprouted grain tortilla, add avocado and make a wrap out of it. This is especially good after sitting overnight but is still amazing right out of the bowl. Enjoy! Previous Post My Incredible Edible "Eggs"
Next Post Decadent "Chicken" Salad Wraps!